A two-minute, perfectly portioned dessert? 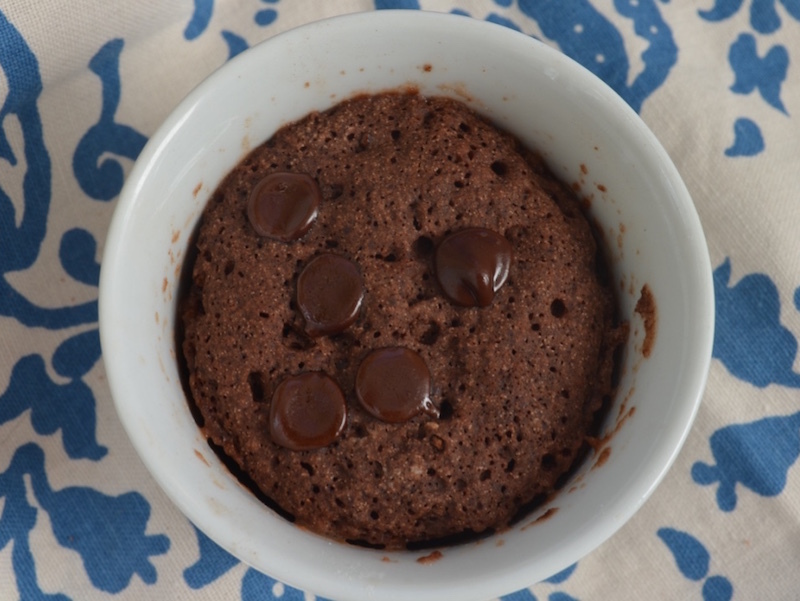 It sounds almost too good to be true, but this mug cake is just the thing to satisfy your sweet tooth — and/or the ideal-sized treat to stress-eat. It’s also an easy recipe for kids to “cook” — and a perfect solution when you are trying to avoid the temptation of a full-sized cake, or even an easy option when you realize that after all your Thanksgiving meal planning, you forgot to consider dessert! This mug cake is light and fluffy and studded with gooey chocolate chips. We love that there are no bowls to clean: everything gets mixed and heated up in a microwave-safe mug. It is also wide open for experimentation. We’re going to try using peppermint extract next time for a minty treat. Read on for a simple dessert that is going to quickly become a mainstay in your go-to quick and easy recipes. It goes without saying that it would also be divine topped with coconut whip cream or your favorite non-dairy ice cream! Mix all the ingredients (except for the chocolate chips) together in the mug. Stir for about 15-20 seconds until they are well-combined and form a batter. Add in the chocolate chips, mixing gently and making sure to leave a few chocolate chips at the top of the cake for extra gooeyness. Place in the microwave and heat on high for one minute. Carefully remove from the microwave, let cool slightly, then serve. Enjoy! A two-minute, perfectly portioned dessert? 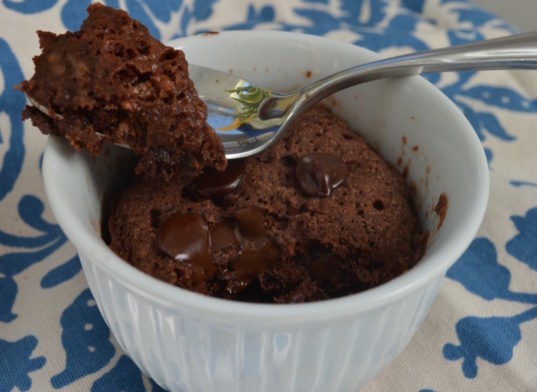 It sounds almost too good to be true, but this mug cake is just the thing to satisfy your sweet tooth -- and/or the ideal-sized treat to stress-eat. It's also an easy recipe for kids to "cook" -- and a perfect solution when you are trying to avoid the temptation of a full-sized cake, or even an easy option when you realize that after all your Thanksgiving meal planning, you forgot to consider dessert! This mug cake is light and fluffy and studded with gooey chocolate chips. We love that there are no bowls to clean: everything gets mixed and heated up in a microwave-safe mug. It is also wide open for experimentation. We're going to try using peppermint extract next time for a minty treat. Read on for a simple dessert that is going to quickly become a mainstay in your go-to quick and easy recipes. It goes without saying that it would also be divine topped with coconut whip cream or your favorite non-dairy ice cream!